Motherhood! It’s a simple word. But you can never understand its real meaning of this very simple word until you become a mother. This one simple word has so much depth to it. It has some emotions that you never experienced and the love that you never felt. It has joy that makes your head spin with giddiness and fun that will take the definition of fun to new levels. The spectrum of emotions you go through with in a couple of minutes is something you will never experience until you parent a child. Well, it is true in my case! The pure joy of watching your toddler is like re-living your own childhood. His smile, his giggles, his frustration and then his pride in new accomplishments, one can never get tired of watching it. You learn to discover new phases of life with your kid, you learn the life’s lessons as how to find joy in small things, not to turn your backs to things just because you don’t know them or understand them, never give up even if the task frustrates you, and most importantly to love unconditionally. I have learned to stop and soak in the surroundings and see the world through his eyes. This is perhaps my one and only chance to see things all new, shiny and bright through Lil Dumpling’s eyes and I will always be grateful to him for showing me the world differently. All said and done, there are many challenges that motherhood throws at you at least expected times. There are wonderful days when you feel your cup runneth over with so much love, fun and joy that it hits you in your face when something unexpected happens with in a couple of minutes. On such days you may feel like questioning every single decision you made and you may even want to hide or run away from the situation. But it is these challenges, good or bad, that gives life purpose. Motherhood is all about how you embrace them, even when your soul is exposed to the world to witness it. As new challenges that the motherhood brings keeps you on edge, makes your heart beat faster and the rush of adrenaline can be felt in every single nerve. No extreme sports can make you feel as alive as the parenting to a child! One such challenge I face very often, and also many mothers all over the world, is the constant change in Lil Dumpling’s taste in food. If he liked one particular dish yesterday, there is no guarantee that he’ll show the same enthusiasm in eating the same tomorrow. The day to day activities of the busy toddler involves from jumping, screaming, climbing, more screaming, digging, dancing, screaming in the name of singing, discovering, laughing, playing, reading, and exercising those strong lungs by more screaming to name some! It also involves dissecting the every food that’s been placed on his tray, except for chocolate, cookies and peanuts, until he is satisfied that Amma has not sneaked in any unwanted things which is high in nutrition and supposed to be good for him according the Gyan she acquired from the internet. Huh! All that gyan, bribe, bullying and pacifying never works once his royal highness has made up his mind against even tasting the teeny-tiny bit which you can only see when put under the microscope. So finding the food that he likes and keeping his interest in it is the most difficult challenge I face as a mother. These days his love for raw sprouted moong beans is greater than his love for chocolates and I am really excited about it. I was a picky eater when I was a child but my mother never gave up. So she is always there for me when I feel lost. When she heard his love for sprouted moong beans and Cabbage Akki Rotti, she suggested combining these two ingredients in a single recipe. To keep the Rotti moist and soft, she asked me to use some freshly grated coconut which also gives the rotti sweet flavour. That’s when the recipe for Sprouted Moong and Coconut Akki Rotti was born. 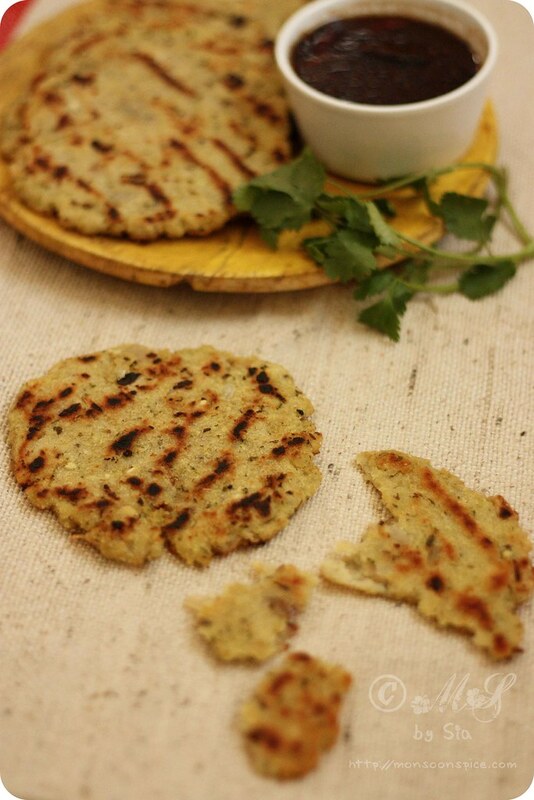 These Sprouted Moong and Coconut Akki Rotti are vegan friendly and also gluten free. The sprouting process makes already nutritious moong beans healthier and easy to digest. They are not only low in saturated fat, sodium and cholesterol but also a good source of protein, iron and many other nutrients. Instead of buying sprouted moong beans from supermarkets, I prefer to sprout them at home as I can be sure about their quality and freshness. All you need to do is wash the whole green moong beans and soak them in water for 8 hours. Then transfer them to the colander and keep it away from sunlight for two days. Make sure that you rinse them 2-3 times a day to prevent from souring and also providing them with moisture. That’s it. 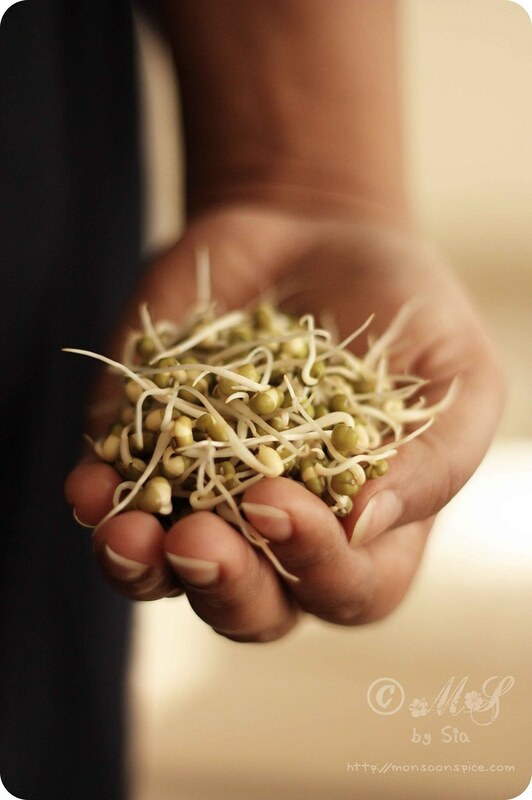 With in three days you have these sprouted moong beans to use in salads, curries, dals or other culinary experiments. I have used these beauties in making Sprouted Moong and Coconut Akki Rotti which has become Lil Dumpling favourite finger food. The ground, coarse paste of sprouted moong beans, coconut, coriander leaves and tiny green chilli is used in making gluten-free and vegan akki rotties. 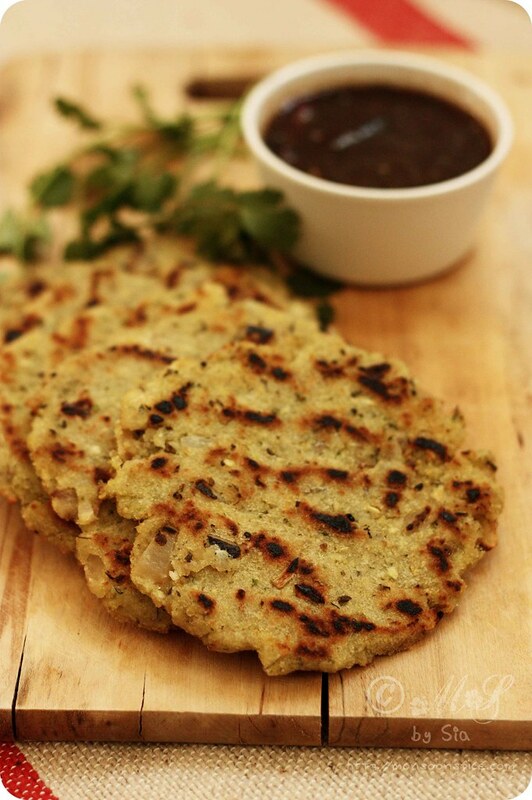 The addition of onions gives it a crunch and sweetness to the crisp, melt in mouth Sprouted Moong and Coconut Akki Rotti. It is real delight to watch Lil Dumpling tear the rotti into small pieces and devour them by enjoy every single bite. So when are you making them for your Lil Dumpling/s? 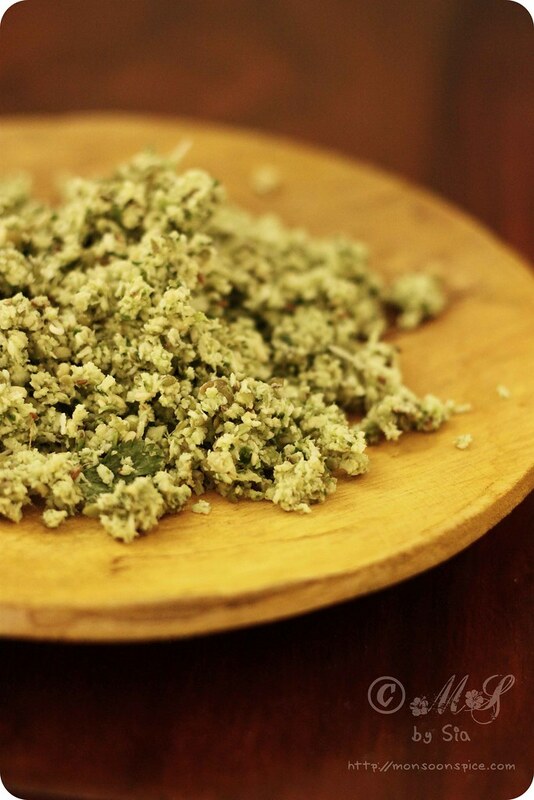 Grind sprouted moong beans, grated coconut, coriander leaves, green chillies and cumin seeds to a coarse paste (refer the photo above) without adding any water. Heat oil in a deep pan and add hing and finely chopped onions. Saute till they turn translucent, about 2 minutes. Next mix in ground paste and cook for a minute or two, stirring it continuously to avoid the paste from sticking it to the pan. Add about 4 cups of boiling water to the pan and mix in salt to taste. Let it come to a gentle boil. Add the rice flour and give it a good mix till all the water in a pan gets absorbed. The dough should be soft and pliable and you should be able to pat it in to flat bread using your fingers. 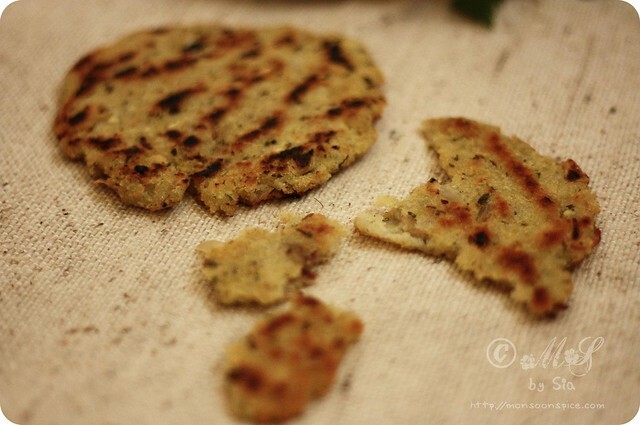 The best way to make this Sprouted Moong-Coconut-Akki Rotti is to pat them directly on tawa/griddle. If you are not very confident about patting them directly on hot griddle, then you can pat them on greased banana leaf or aluminium foil or thick plastic sheet and then transfer to the hot tawa. But patting them directly on the tawa gives this rotti a smooth finish and a very crisp texture on out. To make them directly on the tawa (I prefer non-stick tawa/griddle), take large lemon sized dough and place it in the centre of a tawa. Now with the help of your fingers, start patting them to form a circle of ½ cm thickness. If the dough sticks to your hand, simply dip your finger in a bowl of cold water and continue to pat to make round rotti. Now place the tawa/griddle back on flame and let the rotti cook on medium flame. Add a tsp of oil or Ghee around the edges of rotti and let it cook undisturbed for around 3 minutes. Add another tsp of oil or ghee on top and flip it around gently and cook for another 2-3 minutes till brown spots starts to appear and the rotti turns crisp. To continue to make more rotti, invert the hot tawa or griddle and place it under cold running water for few seconds to cool the tawa slightly. Dip the fingers in cold water and proceed to pat the dough into thin rotti and cook it following the directions. 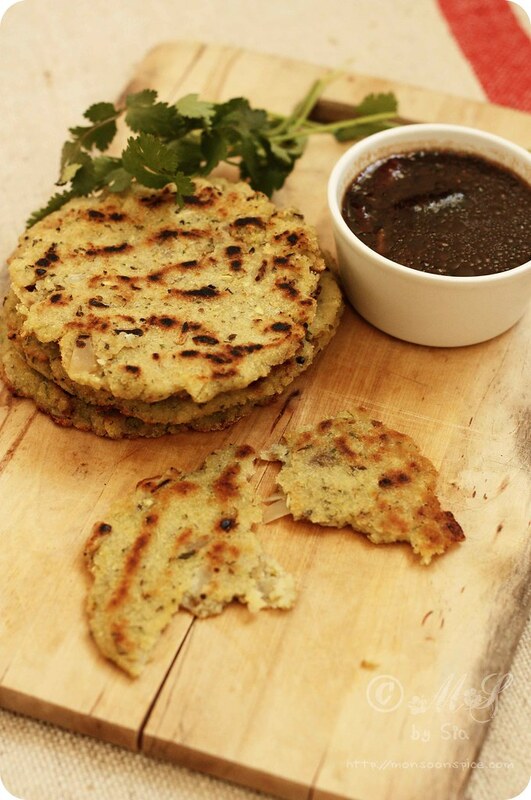 Serve these delicious Sprouted Moong and Coconut Akki Rotti with any chutneys (preferably coconut based chutneys), or Sweet Tamarind Chutney or Sambar. I like it with delicious sweet tamarind chutney and HD likes it with pure homemade butter and sugar/honey combination. And our Lil Dumpling loves it when served plain with a dollop of pure Desi Ghee or butter or with a bowl of chilled yogurt. You can also add green leafy vegetables like finely chopped spinach or fenugreek leaves or even dill. I usually use non-stick tawa but you can also use cast-iron tawa which gives perfect crisp texture to this delicious Sprouted Moong and Coconut Akki Rotti. 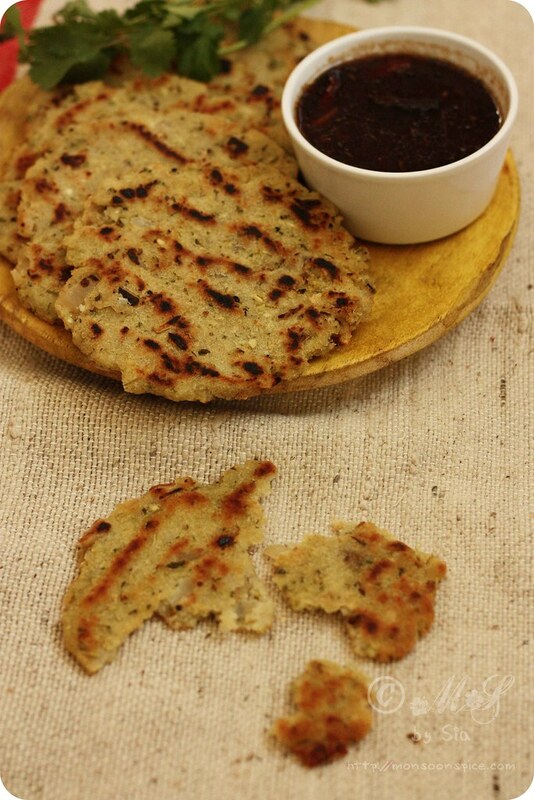 The best way to make this Sprouted Moong and Coconut Akki Rotti is to pat them directly on tawa/griddle. If you are not very confident about patting them directly on hot griddle, then you can pat them on greased banana leaf and then transfer to the hot tawa. But patting them directly on the tawa gives this rotti a smooth finish and a very crisp texture. Those must be really tasty! An interesting recipe. Marvelous. Healthy and delicious roti...Lovely clicks..
looks yummy and its making me hungry right now!! Dear Sia, That's a very healthy akki roti, perfect for a breakfast and surely as you said..finger food. thanks, would like to try it out on sat. meanwhile i would have to sprout the moong. could you also post the recipe for sweet tamarind chutney please..
Mmmmmmmmmmm looks fantastic! I bet it tasted Yummmmmmmm! This is a very interesting recipe Nish loves akki rotti, I can try this for his lunch box. Thanks for sharing. i love all the recipes posted by u..!! i would wanna try any dish with soya chunks..
if u could post a few recipes made out of soya chunks, that would be lovely.. I made this recipe today and it was a hit with my daughter too who is 1.5 years old. I added some palak according to your tips and it gave a beautiful green hue. Thanks for this yummy recipe. delicious roti. Looks so appetizing, I have bookmarked the recipe. thx!